Welcome to Rat Shed Press! We offer a visionary slice of contemporary artmaking by emerging and established artists. until studio space was available in a converted garage. Our logo, the Rat Shed photo, is the actual backyard rat shed. The welcoming pineapple, seen on the front of the shed, only seemed to attract more rodents. 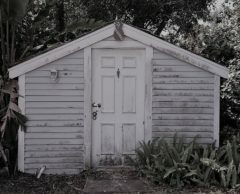 Opening the door to the shed was always an adventure in rat evasion and sometimes, a hasty escape. From these humble beginnings came Rat Shed Press, dedicated to visual arts advocacy and accessibility to the arts for all. Rat Shed Press was founded on the premise of visual arts advocacy. We believe in the power of the arts to produce social change, to be a vehicle for self-expression, and to support the creative diversity of all people.